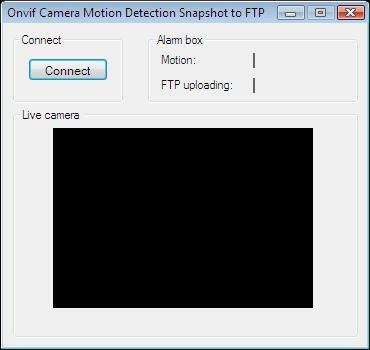 This example demonstrates how to take a snapshot and upload it to an FTP server when motion has been detected. To implement this example, you must have OZEKI Camera SDK installed, and a reference to OzekiSDK.dll should be added to your Visual Studio project. How to handle alarms by taking a snapshot and uploading it to an FTP server using C#? To establish the connection properly between your application and an IP camera you should apply the same code snippet what you have used in the example (How to connect to an IP camera device using C#?). Important: you should study this article in order to find out how to setup your Windows Forms/WPF Application correctly. It's also recommended to visit the How to setup viewer side motion detection and the previous How to handle alarms by taking a snapshot picture and sending it as e-mail articles before you begin to studying this functionality. first, we'll need two new class members that can handle the FTP connection - an FTP request that implements an FTP client and a stream that provides a generic view of byte sequence. When motion has been detected the program is going to take a snapshot (just like in the previous example). But now, the application is going to upload it to an FTP sever by calling the UploadFTP()method. The first argument of this method is a string that represents the location where you would like to upload the file and the second argument is the filename that you would like to upload. The .NET Framework supports the FTP uploading so you can use the System.Net.FtpWebRequest class. In the UploadFTP() method you have to use an existing FTP URL, username and password. Finally, if the uploading was successful the application is going to indicate it on a GUI label, otherwise an information dialog will display the error message. After the successful implementation of the functions and the GUI elements, the application will work properly. Pressing the connect button will load in the image of the IP camera deviceconnected to your PC into the panel that you can see on the picture. When the motion detector detects motion, the motion label's text will be true. After the snapshot has been successfully uploaded, the FTP label will indicate this. I uploaded a snapshot, but I didn't find it there. Why? The FTP server is overloaded permanently.